AFTER six years in the Ladbrokes Championship, Dumbarton will be playing in League One next after losing 2-1 on aggregate to Alloa Athletic ibn the Play-off Final. They were only one minute from safety, but visiting no..9 Ross Stewart scored in the 93rd minute to take the tie into extra time. Alloa missed two glaring chances in the first minute of the opening period, as ex-Son Jordan Kirkpatrick's shot was beaten away and Iain Flannigan prodded wide. From then on Dumbarton started pressing hard up front and defending well as the visitors sought to hit back. As the half progressed, however, the Wasps enjoyed more possession up front, while the best chances fell to Sons. Tom Walsh and Kevin Nisbet were among those who snatched at the ball in good scoring positions, and Dougie Hill had a header palmed out. Alloa Athletic came out blazing after a goalless first half, putting Dumbarton seriously under the cosh at the back. It was an energetic but nervy affair, with desperate attacking and desperate defending in equal measure. With one minute left of time added on, disaster struck. Stewart grabbed the goal for Wasps that gave the visitors a 1-0 lead (pictured), wiped out Sons first leg advantage, and sent the tie into extra time. 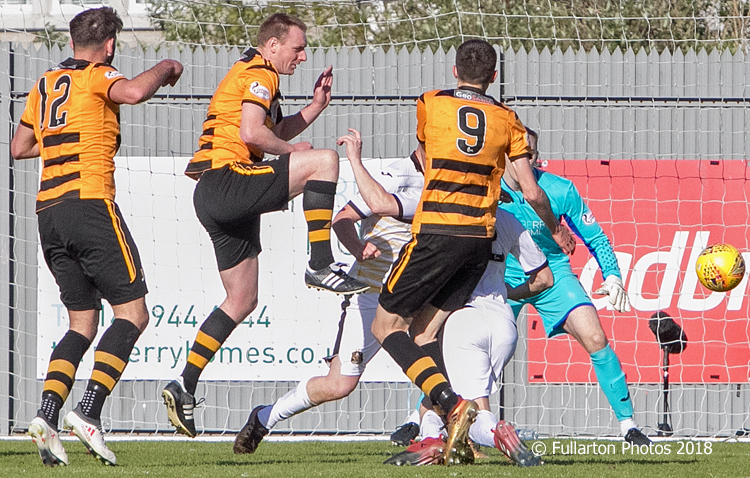 Shortly after the restart Alloa were in front as Kirkpatrick rifled the ball into the top corner of the net to leave Dumbarton needing a goal to stay in contention. The second goal proved a fatal blow for Sons, who were unable to recover in a tense final 15 minutes. As the final whistle blew Alloa fans celebrated promotion and Dumbarton were relegated from the Championship after six seasons in the second tier.